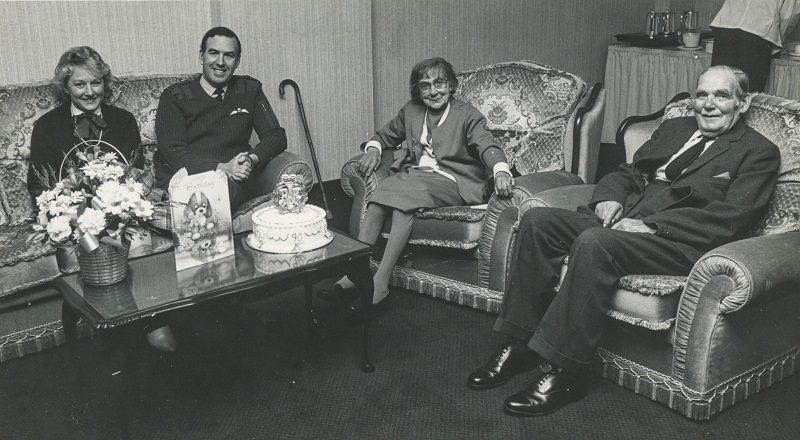 Eliza Olive Webb, known as ‘Olive’… she was born in 1897 in Brinkworth. She was the third girl of (eventually) twelve – there was three brothers who arrived after her. So she was the 8th, the youngest of the girls. In 1918, according to the records, she joined the Women’s Royal Air Force, in the July. But I think, and I’m almost certain on this, that she already was in the Women’s Auxiliary Army Corps, and she transferred to the [Women’s RAF] – but there is no records, or the records don’t exist of that, so I’m only assuming that. Because my father used to tell me that he went to Wootton Bassett station, from Brinkworth, to meet her once coming home, and, by 1919, when she was mainly in [the Women’s RAF], he’d left home and was working away. So I’m going on that. 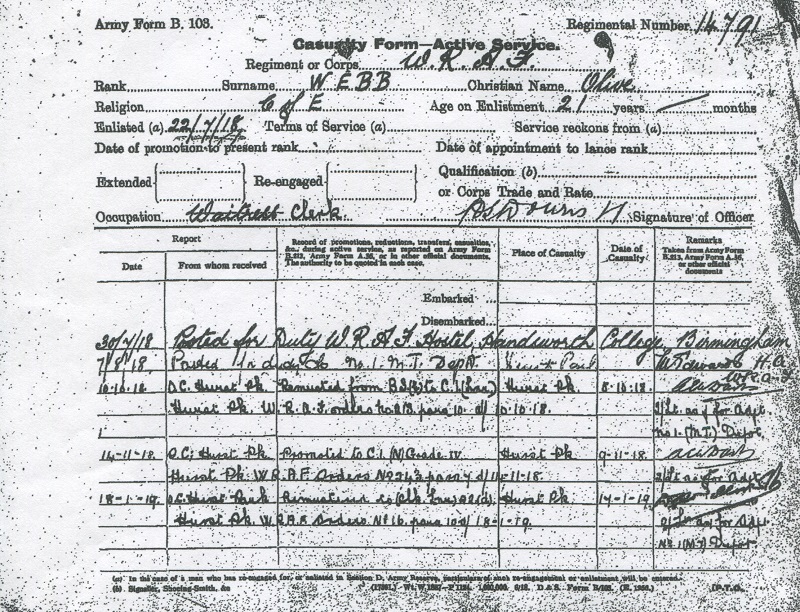 And also, on the Army Form B108 her occupation was given as a ‘waitress’, which it would’ve been if she was in the Army Corps – and then that’s crossed out and it’s got ‘clerk’ next to it so she was a clerk in there. She joined up on the 30/07/1918 which meant to say that the war was still raging on in France and the rest of Mesopotamia and Africa, and wherever it was in the world they were fighting… it was really and truly the First World War. From there, according to her records, she was posted to several places in London – some of it must’ve been training, but it doesn’t say so. From there she went to Blandford, and from Blandford in Dorset she then went to France. 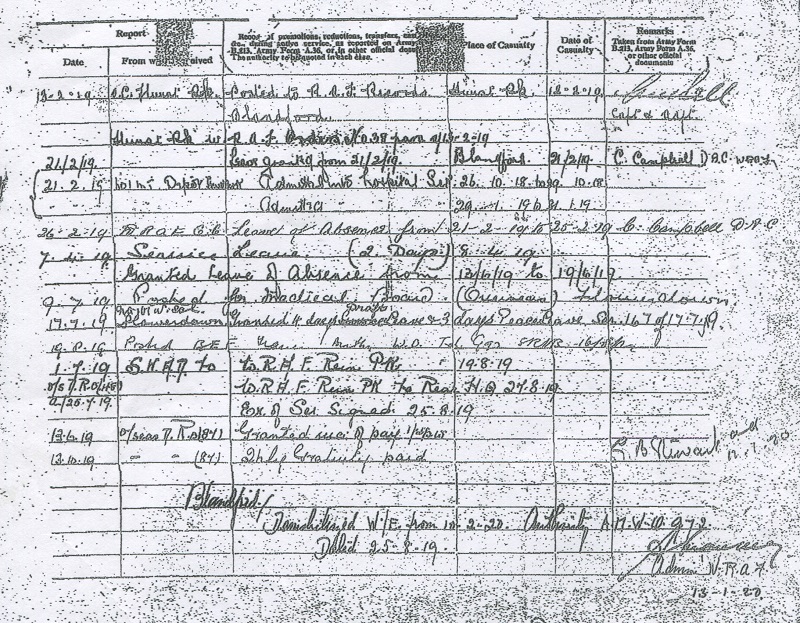 Unfortunately it don’t say where she was in France, and finding where she was posted is a bit difficult… to know exactly which regiment, which station she was posted to. But she certainly was in France in 1919, and she stayed there until she came out in 1920. Unfortunately, she didn’t want to come out – she told me many times! She was going to make it her life to stay in the Women’s RAF, but they made an order in 1920 and closed the Women’s RAF, much to her disgust. And if you knew Olive… she was a feisty woman! I wouldn’t like to have seen the officer who told her she was coming out – she was going to be forced out – because even when she was in her 90’s she still was feisty, believe you me. She did not put up with nonsense. I remember her telling me once that the hunt got into her garden, and the Huntsman saying ‘open the gate and let the hounds out!’… she said ‘get off you fat [blank] and open the gate yourself!’. You know, she was about 90! So I guess that that’s what happened. 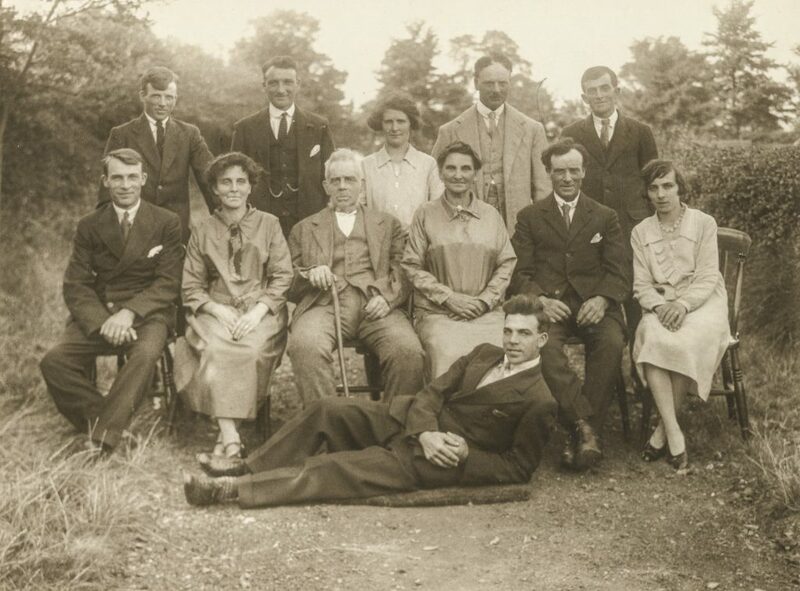 In this family photo from 1928, Olive can be seen on the far right of the middle row. 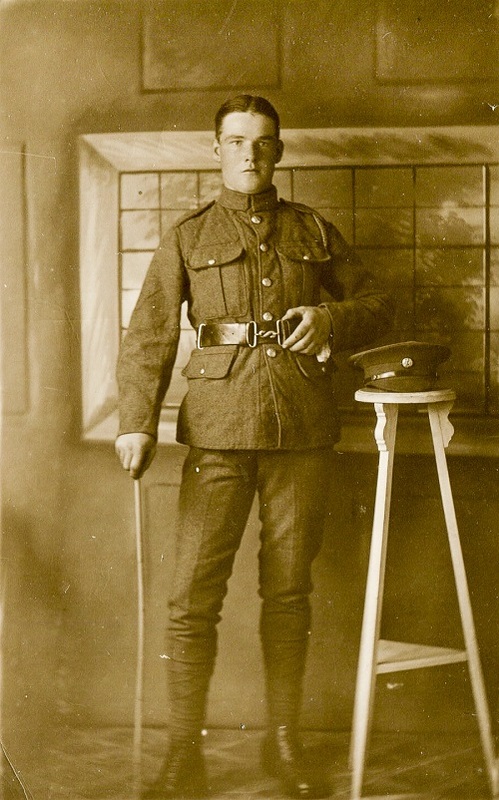 She then met her future husband [Frank Whitehead] as a cook – I think she was working somewhere, I don’t know quite where – and he was an ex-First World War regular soldier, and they married in 1922. They did not have any children, I don’t know why, but they didn’t. By 1987 it then was her 90th Birthday, and my brother wrote to the RAF at Lyneham pointing out that they had a lady that served in the First World War and it’d be nice if she could visit the station. And they really did make her… they sent over the Squadron Leader to see her, and he came and saw her at her house and then invited her to a birthday party in the Officer’s Mess and they really did make a fuss of Olive. 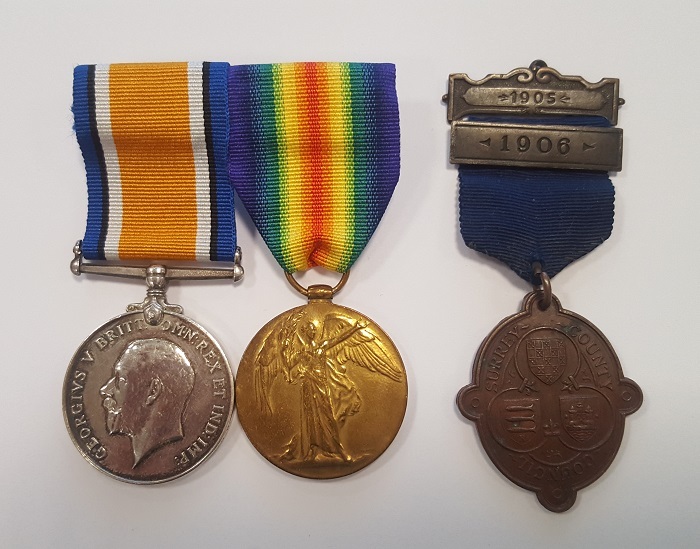 While she was there, they asked why she hadn’t had her Victory and War medal, and she said well, she probably moved about, or didn’t claim it, or it was sent to the wrong address – she didn’t know. 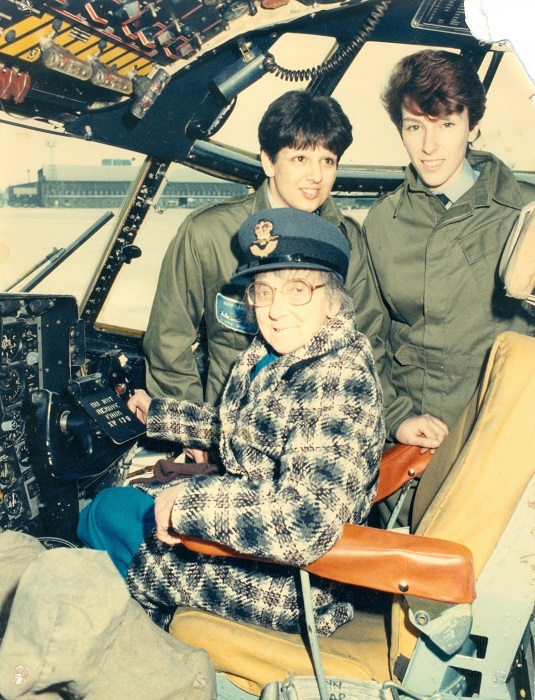 So the following year, 1988, they presented her the medal – Group Captain Edwards – who was the Commanding Officer at Lyneham at the time. So she [Olive] went up there and received her medals with all the rest of the people… she was on parade… I have a few bits of cuttings from the paper. Actually it got into the national press as well, and onto the television. They really did make a fuss of her up at Lyneham, and then in 1990 she died. She always said that she regretted ever coming out of the Women’s RAF. Frank had a very interesting soldiering career, until he came out. He was born in Epsom, Surrey, they were a game-keeper family – his grandfather was a game-keeper, so was his father, and so was he. They were nice people, but they were brought up in a different way to most other people around there, you know. They sort of… he didn’t care what he shot. He was quite adamant – he enjoyed his war! It does sound awful, but he did. I don’t think that anybody that knew Frank would say that he didn’t enjoy his war. 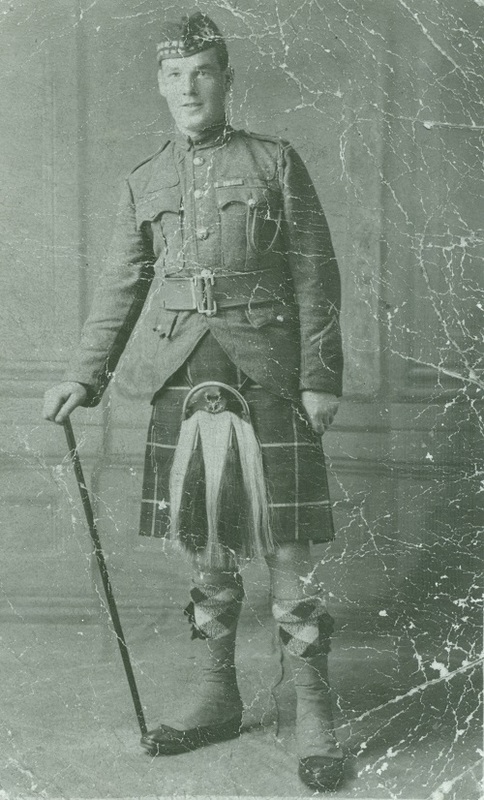 In fact, he could remember most things he did, and also he was a sniper: he first of all was with the Northampton’s Eastern Brigade, and then he went to the Leicester’s, which were part of the Eastern Brigade, and as the war came to a final end, he then joined the Seaforth Highlanders, which he was extremely proud of, being a man from Surrey, being a ‘Jock’. And he did like people who called him ‘Jock’, believe it or not – for years afterwards! But yes, he was a hard man, but a fair man, I would say. But he was a hard man, there was no doubt about that – and probably that’s why they had so many posts, because he fell out with somebody, somewhere. He was a typical game-keeper from the Victorian age, if you might say so. He was a brilliant gardener – people used to come on coaches to see his front garden at Lea near Malmesbury. The coaches used to stop and they’d all get off and look at his garden – he really was an excellent gardener. In fact, as the Second World War started, he was down in Essex, working there as a gardener – and they got bombed out there and that’s why they came back to Wiltshire. He also ran the Home Guard in Brinkworth which… I don’t think he was that popular, from what I can gather! He thought they were all dodging the Army anyway, and they should be out there. He thought that people shouldn’t be given exemption – there was ‘no such thing as exemption’ – you went. The Germans wouldn’t have bothered you, you know. And that’s how he was – he was really a hard man, I must admit, but fair. They [Frank and Olive] had no children, I was probably the nearest person to her [Olive], although there were some more cousins round there – but we used to go and visit her every week, and him. If they wanted anything, or to go somewhere, I used to take them. He died first, Frank, on the 4th February 1989 – and then she died, believe it or not, on the 4th February 1990. So they both died within a year of each other, on the same day, which seems a bit strange, but it’s perfectly true that that’s what happened to them. They’re both buried at Lea Church, which is just outside Malmesbury, and I still go over and keep the grave tidy for them. So I was really close to them I suppose, in that sense, you know – I looked after them as best we could at that time. I think the worst thing that ever happened to her [Olive], in a way, was the fact that the Women’s RAF was shut down… she told me many times that it was the worst thing that ever happened to her, that they didn’t continue with it. Of course they did in 1939, but then she was about 43 or 44 and obviously she was too old to go back into the forces by then. So she didn’t achieve what she really wanted to, and that was to stay in the Armed Forces. She always said she enjoyed herself in there, and she got away from these, as she said, ‘a skivvy in a big house’, you know: where you had to bow and scrape to the aristocracy and people – she wasn’t that sort of person that was too willing to do that. She wasn’t quite like Frank – I could tell you Frank’s tales a hundred times – she wasn’t quite like him, she was a bit more reserved about it, and so was her brothers who went. They were the majority who didn’t want to talk about what happened to them or what they saw out in the Western Front or Mesopotamia, as Reg went to, and Gallipoli – they just didn’t want to talk about it, they wanted to put it in the background and forget it ever happened to them – which many, many of them did. The lot of them were not like Frank – Frank was a total one-off as far as I can see, that was willing to discuss exactly what he did. Frank was in charge of a platoon of the Wiltshire Home Guard in WW2. He can be seen standing at the far right end of the middle row, wearing a moustache. 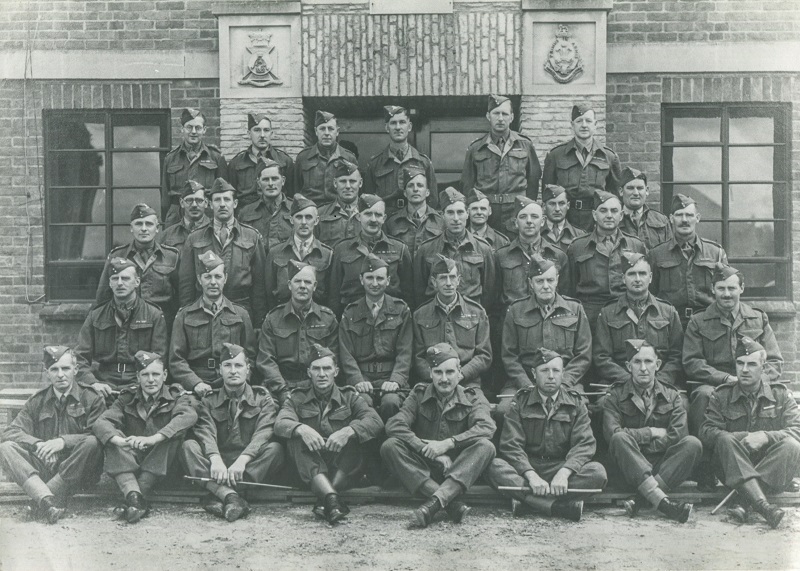 Frank openly shared his belief that the men of the Home Guard were ‘army-dodgers’ and slackers!